Heading to the desert of the southwest can be an epic adventure for families who love nature with a side of luxury. From adventurous ATV drives in the desert to picnics under pecan trees, the city has something for all. 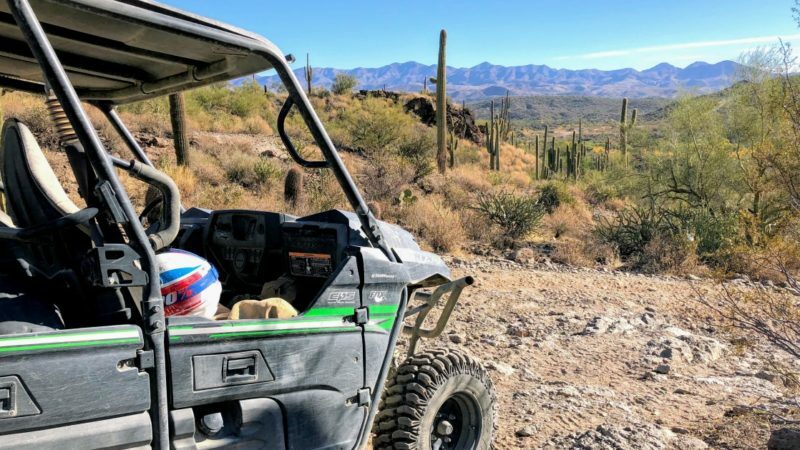 Whether you’re planning a family vacation to the Valley of the Sun or just looking for things to do in Phoenix this weekend, you’ll find 7 fun ideas here. My new year kicked off with an escape to the southwest. A friend put together a trip for four friends from across the US to travel to Arizona for a getaway to start off the new year. From relaxing spa treatments to off-roading in the desert, we explored and tasted our way around the sprawling Valley of the Sun. 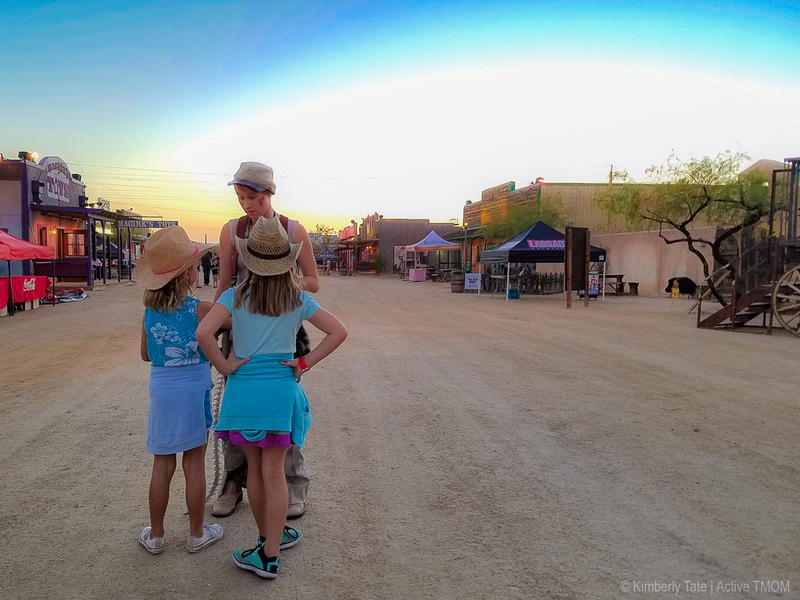 Even though I visited the city on a girlfriend’s trip, I often wished my daughters were there to experience all the fun things to do in Phoenix. TravelingMom Tip: The Greater Phoenix valley has many neighboring cities beyond Phoenix, so a car is a must. The desert is a beautiful spot and driving through it can be a fun way to experience the unique ecosystem. 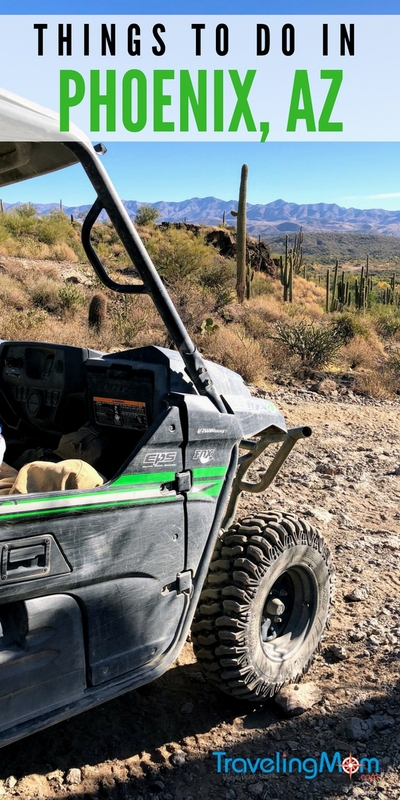 On my recent trip to Phoenix, we headed out on a UTV with Arizona Outdoor Fun. We had a guide who led us into the desert and shared fun facts about the desert ecosystem when we made stops along the way. We headed out in a UTV, which I can only describe as something of a rugged golf cart. It’s a great fit for families since they’re a bit more stable than ATVs, and can hold a family of four. TravelingMom Tips: This will be a pricey excursion for a family of four (a two-hour tour for four people will cost $125 per person). And second, dress to get dirty! Perhaps bring a bandana for your hair and wear sunglasses or goggles if you have sensitive eyes. I’ve been to Phoenix before on another trip, and it’s always impressed me with its great food spots. On this visit, we discovered the Fresh Foodie Trail in Mesa, Arizona, a Phoenix neighbor. One of my favorite spots was called Agritopia. Imagine old farming fields that are being reimagined as a planned community. Our stop at Agritopia was for breakfast at Joe’s Farm Grill which is a must visit. 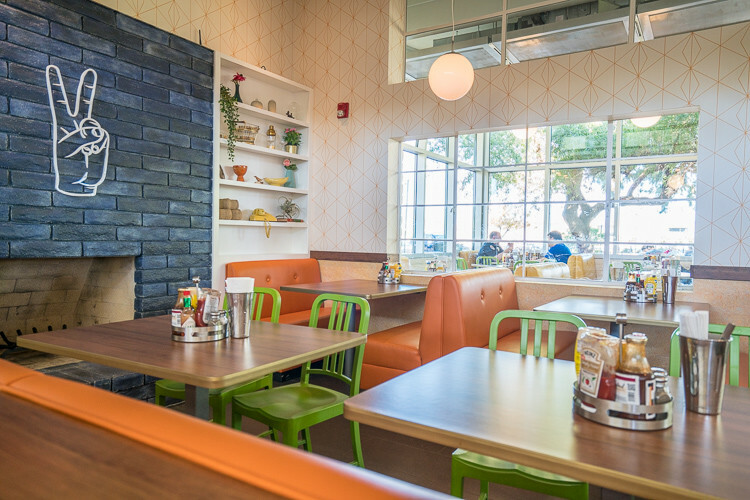 It’s the perfect spot for families with delicious waffles and picnic tables out back for families to relax and soak up some of that Phoenix sunshine while enjoying your meal. Joe’s Farm Grill also has a fun family story as it was the old homestead of one of the area farmers and still has some nostalgic family features. Agritopia is all about buying local. Joe’s and the other restaurants serve local produce grown on the Farm. If you like to buy local goods, head into Barnone for some handcrafted gifts and even a brewery and winery. You can even buy fresh harvest produce at The Farm Stand. 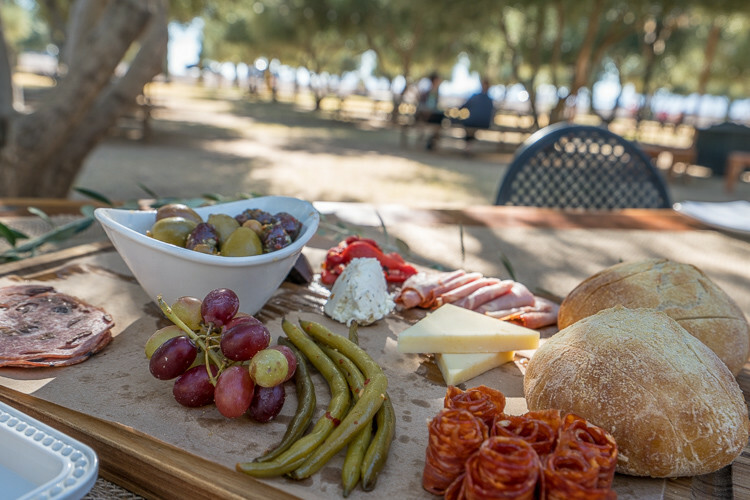 If you enjoy farm-to-table spots when you vacation, head over to the Queen Creek Olive Mill to see Arizona’s only working olive farm and mill. The farm offers a tour where you can learn about how they grow and harvest the olives, and get some taste testing experience. Who knew there were so many different types of olive oil?! You can also taste test your way through their marketplace and shop for locally made extra virgin olive oils, balsamic vinegars, olives and other local goods. They have an Italian eatery onsite as well with lovely picnic benches outside, making it the perfect spot to enjoy lunch. As a girl’s trip, we knew visiting a spa was definitely one of the fun things to do in Phoenix. During our stay at the Hyatt Regency Scottsdale Resort, we booked treatments at their onsite spa, Spa Avania. I enjoyed a customized 60-minute massage where I chose my own essential oil blend scent and the music I wanted playing during the massage. But Spa Avania is more than just a treatment spa. It’s a wonderful spot for a girl’s trip or couple’s retreat. The spa features a co-ed salt water pool with loungers as well as men’s and women’s’ hot tubs near their respective showers. 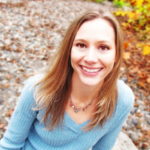 Traveling Mom Tip: Traveling as a family and want to enjoy spa treatments? Alternate treatment days, so one parent can have a treatment while the other does something with the kids, then swap later in the day or on another day. Also take advantage of the hotel’s kids’ program, like Camp Hyatt at the Hyatt Regency, for childcare while you’re having your treatments. If you’re traveling with older kids and looking for some Arizona adventures, I highly recommend doing a desert segway tour. And taking an off-road Segway into the desert is a pretty cool adventure. 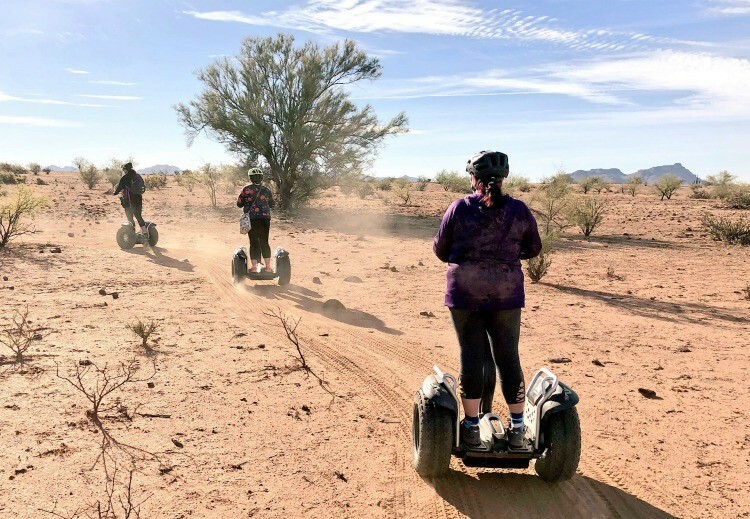 We partnered up with Fort McDowell Adventures for a Segway tour around part of the 25,000-acre Fort McDowell Yavapai Nation. Along the tour, we learned about types of cactus and even spotted some old animal bones. This is an adventure suited for older kids and adults since one wrong move could land you in a pile of prickles! While this is a food spot, I do think it deserves to be on my list of things to do in Phoenix. Our group enjoyed a fabulous lunch at The Farm at South Mountain, but it’s got more than just food. There are outdoor games you can borrow to play, special classes you can register for in advance, and even chickens you can visit. Starting the day early, you can enjoy breakfast at their Morning Glory Cafe. For lunch, order some grab and go food at The Farm Kitchen and take it outside to enjoy at picnic tables or on a blanket under their pecan trees. If you’re looking for a romantic date night escape, make a reservation at Quiessence, their upscale farm-to-table dinner restaurant. If you’re a sports fan, you’ll find plenty of things to do in Phoenix. As one of only 13 US cities that have all four major sports leagues, Phoenix can offer up a game almost any season of the year. Their main teams are the Arizona Cardinals (NFL), Arizona Diamondbacks (MLB), Phoenix Suns (NBA), and the Arizona Coyotes (NHL). My personal favorite for families is baseball spring training. 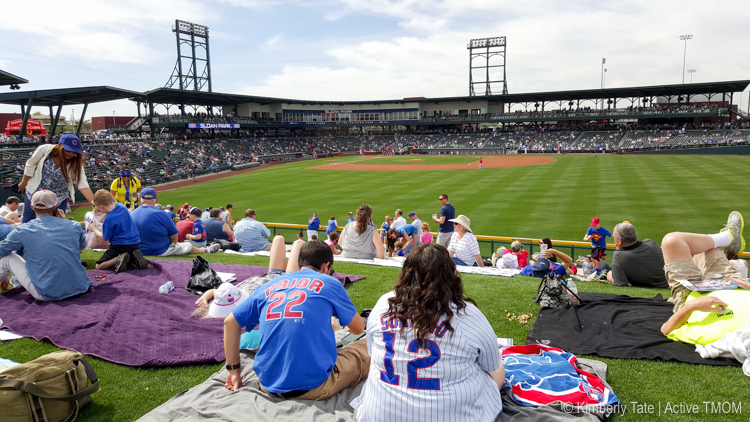 These early season games are affordable ways for families to catch some of their favorite players hitting the field. A definite must do if you’re visiting in February or March. There you have my 7 picks for fun things to do in Phoenix. With so much variety you can create an amazing vacation that features the best of travel, adventure, relaxation, learning, and food! I too appreciate Agritopia, and that jeep tour in the desert. Thanks for a story of memories, and new ideas if I have the good fortune of another Arizona holiday. This is so great. I enjoy reading your story about your experience in Phoenix especially the Off-road segway through the desert. It sounds so much fun although I don’t want to land in a pile of prickles, I’m sure that will hurt a lot. I hope that I could experience all the things that you’ve mention if I will be given a chance to go to Phoenix this year. Thanks for sharing this amazing experience.